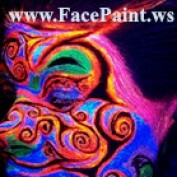 It is at www.facepaint.ws or at www.zolaenterprises.com if you wish to really know about me. I like to skate and do bodypaint and even tried and love body surfing at the ocean. I hope to go again. Videos and photos of me and my skating and paint ect is on both sites. I do live cam shows weekly or as often as I can free for all. I like to share the fun and colours. Kind of a weird girl but, harmless once you know me. I also play guitar and write.